A man attacked by a great white shark at Fish Hoek beach in Cape Town on Wednesday afternoon was rescued by a stranger, the NSRI said. “It appears he was rescued from the water by a bystander who left the scene before we could identify him,” National Sea Rescue Institute spokesperson Craig Lambinon said. Lambinon said the victim was believed to be a 42-year-old British citizen living in the Cape Town suburb of Plumstead. The man was stabilised at the scene and airlifted to Constantiaberg Medi-Clinic in a critical condition. “The man was conscious when paramedics attended to him on the beach, but was sedated on-scene by paramedics in their efforts to stabilise the patient,” Lambinon said. 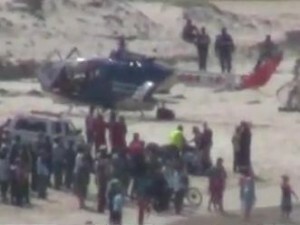 The City of Cape Town said when the man entered the water, the beach was still closed. A shark flag, indicating the presence of a great white, was flying. A shark spotter stationed on the beach was warned by a spotter on the mountain that someone had entered the water. The spotter then ran to Clovelly Corner to try and get the swimmer out of the water, but the attack took place before he could reach him. The city said the attack happened around 12.15pm. Shark spotters sighted the shark at 10.45am and then closed the beach. The white shark flag was raised and the siren set off. The victim of the shark attack was the only person in the water at the time. Fish Hoek beach as well as Glencairn, St James and Muizenberg beaches were closed as a precaution until further notice. The shark was still in Fish Hoek bay in the afternoon and being monitored by the spotters. Note: Please see the related videos in our ‘Video Section’ : 1st Video 2nd Video 3rd Video .